Despite recent improvement in post-resuscitation care, about 50% of patients resuscitated from cardiac arrest die or have poor neurological prognosis. Severe neurological damage due to post-anoxic brain injury is common after cardiac arrest and is a major cause of post-resuscitation mortality., Early prognostication is important in patients who are comatose after resuscitation from cardiac arrest because inappropriate treatment in patients with no chance of a good neurological recovery can be avoided and relatives can be provided with correct information. In 2006, a landmark review from the Quality Standards Subcommittee of the American Academy of Neurology (AAN) recommended a sequential algorithm to predict poor neurological outcome in comatose survivors of cardiac arrest. This algorithm was based on clinical examination, detection of the N20 wave of somatosensory evoked potentials (SSEPs) or measurement of blood concentrations of neuron specific enolase (NSE) within the first 72?h after return of spontaneous circulation (ROSC). However, these recommendations were based on studies conducted before the advent of targeted temperature management (TTM), which now represents a standard treatment during the first 48 after ROSC and beyond. Targeted temperature management, and the sedatives and neuromuscular blocking drugs used to facilitate it, may interfere with prognostication indices, particularly the clinical examination, and reduce their reliability. Moreover, the AAN recommendations did not include predictors such as electroencephalography (EEG) and imaging studies, for which the evidence was still insufficient at that time. Recent reviews have shown that these investigations can be useful adjuncts to the previous, more established, predictive indices., Based on this evidence, the European Resuscitation Council (ERC) and the European Society of Intensive Care Medicine (ESICM) recently issued updated guidelines on neuroprognostication after cardiac arrest, which included the four main prognostication modalities (clinical examination, electrophysiology including EEG-based predictors, biomarkers, and imaging studies) and recommended that these modalities should be combined whenever possible. The ERC-ESICM guidelines suggested that the prognostication process should not start earlier than 72?h from ROSC after major confounders, especially sedation, have been excluded. In this issue, Friberg and colleagues report the results of their survey on current practices and timing of neurological prognostication in comatose survivors of cardiac arrest. The survey was conducted among the members of ESICM and collated answers from 1025 respondents, 89% of whom used TTM for post-resuscitation care. Twenty percent of responders were outside Europe, mainly in Asia and in the Middle East. Seventy-nine percent of respondents did not consider clinical examination alone as sufficiently reliable for prognostication and instead used a combination of methods, among which EEG and computed tomography (CT) of the brain, along with SSEPs, were considered the most useful. This survey confirms that the single-predictor-based, prognostication algorithm recommended in the AAN 2006 guidelines no longer reflects prognostication practice. Current evidence on prognostication shows that no index predicts poor outcome with absolute certainty. Therefore, using a multimodal approach appears to be the best way to reduce the risk of a falsely pessimistic prediction, which could lead to premature and inappropriate withdrawal of life sustaining treatments (WLST). Apart from ensuring a multimodal evaluation, there could be other reasons for the widespread use of EEG or brain computed tomography (CT) in resuscitated comatose patients reported by the survey respondents. Use of EEG may reflect an increasing awareness of the need to monitor cerebral function and detect non-convulsive seizures in patients in whom sedation and paralysis prevents clinical examination. A brain CT is often performed early after cardiac arrest to rule out an acute cerebrovascular event as a cause of arrest, especially when primary coronary angioplasty and anticoagulant administration is planned. A second important finding of this survey is that prognostication practices varied widely. Only 22% of respondents – mainly from the Netherlands – used national recommendations for prognostication. While this heterogeneity in prognostication practices may have reflected differences in the local availability of clinical skills and equipment, it also confirmed that updated, consensus-based guidelines on prognostication methods were needed. Hopefully, the recently published ERC-ESICM guidelines will go some way to achieving this goal. One of the major inconsistencies identified in this survey was the threshold for defining poor outcome. While poor outcome was defined as cerebral performance category (CPC) 3–5 by 58% of respondents, 39% defined this as CPC 4–5, while the remaining 3% used a different definition. This heterogeneity is reflected in the literature on neuroprognostication after cardiac arrest. 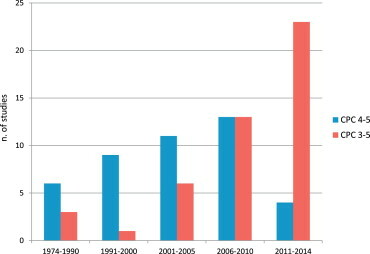 In two recent reviews, which included 87 prognostication studies performed over the last forty years, poor outcome was defined as CPC 4–5 by 56% of studies and as CPC 3–5 in the remaining 44%., Their respective proportions varied over time: while in studies conducted before 2006 the CPC 4–5 threshold prevailed, most recent studies included severe neurological disability (CPC 3) among poor outcomes (Fig. 1). For the purposes of prognostication, the definition of poor neurological outcome after cardiac arrest should ideally be standardised. Recently published guidelines on outcome reporting after cardiac arrest adopted the CPC 3–5 threshold for defining poor outcome. CPC thresholds for poor neurological outcome in 87 prognostication studies, 1974–2014. CPC?=?Cerebral Performance Categories. From Refs. , . Finally, the survey from Friberg and colleagues showed that 27% of respondents were opposed to, or uncertain, about withdrawing intensive care in patients in whom a poor neurological prognosis after cardiac arrest is anticipated. This attitude reflects primarily personal or local values and beliefs, and was observed particularly among respondents practicing in southern Europe, the Middle East, India and the United States. Given the limitations of the current evidence on prognostication, caution in the prediction of poor outcome in resuscitated patients is well justified. Most prognostication studies are not blinded and in some of them the index test under investigation has been used for decisions on WLST, potentially causing a self-fulfilling prophecy. This is particularly likely to occur when WLST decisions are made early. As the authors of this survey affirm, the best prognostic sign after cardiac arrest is that of awakening, but we lack evidence on awakening times in sufficiently large cohorts of patients who are unconscious after cardiac arrest. In some cultures, comatose resuscitated patients receive intensive care support for prolonged periods and these healthcare systems may represent an opportunity for future research and validation of currently recommended predictors. Intellectual: member of the Trauma and Emergency Medicine (TEM) Section, European Society of Intensive Care Medicine (ESICM); member of the Editorial Board, Resuscitation. First author of two systematic reviews on neuroprognostication after cardiac arrest; first author of the ERC-ESICM Advisory Statement on prognostication after cardiac arrest. Financial: paid honorarium Editor-in-Chief, Resuscitation. Intellectual: member of the Trauma and Emergency Medicine (TEM) Section, European Society of Intensive Care Medicine (ESICM); Editor-in-Chief, Resuscitation. Co-author of two systematic reviews on neuroprognostication after cardiac arrest; co-author of the ERC-ESICM Advisory Statement on prognostication after cardiac arrest.